Location: Howth, Fingal, Northern Ireland. 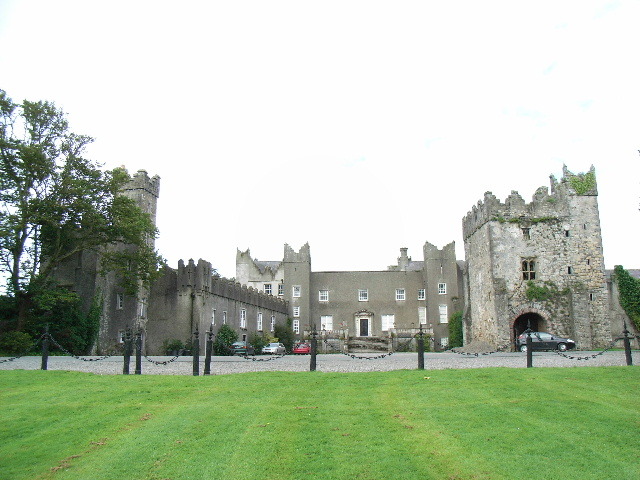 Notes: Howth Castle lies close to the village of Howth, Fingal County in Ireland. It is the ancestral home of the line of the St Lawrence family that died out in 1909. From 1425 to 1767 the title had been Lord Howth, holding the area since the Norman invasion of 1180. It is now held by their heirs, the Gaisford St. Lawrence family. Since 1180 the St. Lawrence family have been the Lords of Howth. Howth Castle has stood on its present site for over seven hundred years, the original one, a timber structure, having been sited on Tower Hill, overlooking Balscadden Bay. The current building is not the original castle, which was on the high slopes by the village and the sea. The great English architect Sir Edwin Lutyens restyled a 14th-century castle built here, overlooking Ireland's Eye and the north Dublin coastline. Castle Howth was depicted as the fictitious "Castle Haloran" from the 1963 Roger Corman and Francis Ford Coppola b-film Dementia 13 (aka "The Haunted and the Hunted") where it was the setting of numerous scenes. In 1892 Rosa Mulholland referred to the grounds thus: "Back on the lower land you must visit the ancient demesne of the Earl of Howth, where a quaint old castle stands in a prim garden with swan-inhabited pond, and plashing fountain, encircled by dark beautiful woods full of lofty cathedral-like aisles, moss carpeted, and echoing with the cawing of rooks." In recent years, the 17th classical landscape was totally obliterated to make for a golf course. The grounds are noted for the wild rhododendron gardens, which are open to the public in summer and some of the oldest, planted in 1710, beech hedges. The castle itself is not open to the public. The "Kitchen in the Castle Cookery School" is based in the restored Georgian kitchens of Howth Castle. The National Transport Museum of Ireland is located in the grounds of the castle. It features lorries, trucks, fire engines and tractors. Also exhibited is the restored Hill of Howth No.9 Tram. Also on the grounds are the Deer Park Hotel and its associated golf courses.